The lady we spoke to when calling in was so sweet and helpful - she also followed up on the day of our check in to ensure we knew our property was ready and made sure we knew how to get there from Denver. Very good customer service. Our stay was comfortable. Loved having a washer and dryer onsite for ski and hottub clothes. Loved Frisco and the location! Place was very clean and accommodating. Very easy to check in and get keys. Beautiful location. Wifi password quit working on our last day, that was the only problem. Unit 106 was great for What we paid. The furnishings were a bit dated but comfortable. My only complaint was the bathroom sinks didnt drain properly. 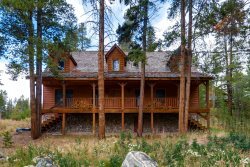 Location was perfect, just steps to free shuttle and walking distance to downtown Breckinridge. I would definitely stay there again and would recommend it to others. Checkin person was very helpful and personable. Very convenient and fit our needs perfectly. We are scheduled (as every year) one week at super bowl weekend and we would like to rent the same property every year whether this property or another. 2018 we stayed at 4 o'clock run and loved it but this property very good also. Would like a way to be a repeat customer/rewards program. Just my thoughts.